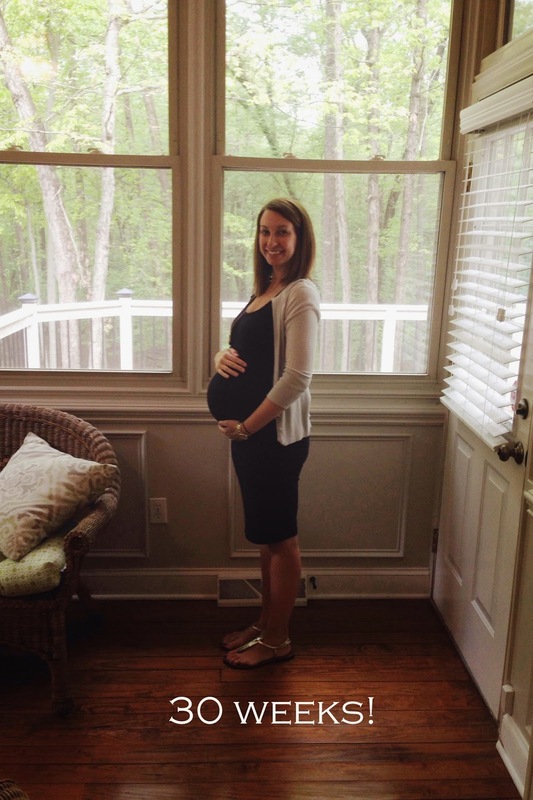 jess at home: bump #2 - 30 weeks! bump #2 - 30 weeks! This past weekend was glorious. Matt and I had an Emerson free statycation and loved it. We ate out for every meal, slept in, and even got things done around the house. We mainly ran errands to look at furniture and I need a laptop now that I will be staying home - just errands that are hard for both of us to present in because one of us is entertaining her or chasing her around now. It was awesome to just go in a store together without her as bad as that sounds. We both missed her though!! Total weight gain: +20. I feel pretty great about this number and would love to keep this total under 30 but last pregnancy I put on a lot towards the end so we will see. Sleep: I have been sleeping great this week minus on or two nights. Can’t complain though. Miss Anything? We went on a date for the first time since this past fall (we need to be better about this) and I really wanted a mojito. I had a virgin, but it just isn’t the same. Movement: He moves so much! I feel him mostly in the evenings when I am on the sofa. Food cravings: Cereal with really cold milk. I think because I have been having reflux, this is what I tend to eat for dinner when I don’t feel as great. I am still on a fried chicken craving which I ate several times this past weekend. This fried chicken sandwich from Napa on Providence is the bomb. I made Matt try it too! Anything making you queasy or sick? My reflux has been soooo bad. We had pizza one night and I had one piece and it seriously ruined my night. Never again. I know better and of course blamed Matt. I also had Panera soup and that really messed my tummy up. I guess from all the sodium? I will be avoiding that as well. Gender: Little dude! So curious if he will look like Matt or me. Matt went on a shopping spree and bought him all sorts of athletic hats which is really cute. Symptoms: Anemia, leg cramps, insomnia, and reflux. I never thought the anemic thing was that important but the OB showed me my levels and explained why Iron is so important and that it will be easier for recovery if I get my levels up. Say no more…anything to make postpartum easier I am ALL for. Happy or Moody: Happy!!!! It feels SO good to quit my job. I know staying home is going to be work especially being as pregnant as I am and ESPECIALLY when I have two, but it makes no comparison to working full time when you don’t like what you do. It was sad when I turned in Emerson’s notice for daycare because her teacher sobbed and told me how much she loves Emerson and asked if she could babysit which I am all for. I love her teacher so this was the hardest part of quitting. Looking forward to: My last day is the 27th which cannot come soon enough! I have another OB appointment that morning so I am excited to see that everything is on track. Exercise: I ran 4 times at 2.3 miles each and did a Tracy Anderson DVD. I like to run in the mornings and Matt wants to go in the office even earlier than he already does once I stay home so I might be throwing in the towel on running once that happens. I can still take her on daily walks but I don’t see my pregnant self being home from my runs by 6am. Maybe I will surprise myself! bump #2 - 29 weeks! bump #2 - 27 & 28 weeks!